Independent Bible Fellowship Church was God's answer to the prayers and planning of a small group of young believers in early 1976. After several months of prayer meetings in various homes, our first Sunday service was held on June 13, 1976, at the home of David & Edith Andrews in Greenwood. God was definitely using this work to further His gospel. We saw a need to centralize our location and in August began meeting in the garage of Ronnie & Shirleen Wright, west of Harrington. 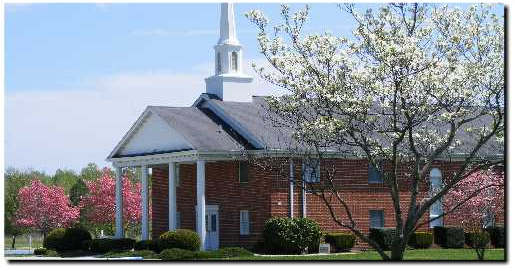 At the time of our pastoral call in July, Ray Newman was teaching at Elkton Baptist Bible College in Elkton, MD. In August, Pastor Newman and his family moved into the area to become the first pastor and begin his first pastoral position. During this busy time, God provided us the opportunity to purchase 18 acres east of town on Route 14. On November 14, 1976, we held our first service in the newly renovated building that had been the old Pilgrim Holiness Church on West Liberty Street. God was truly blessing this fundamental work with many new faces. On August 15, 1982, Pastor Newman felt God was directing him to further his education. In late August, we helped him and his family move to Clark Summit, PA. Thus, began our search for our second pastor. In January of 1983, our second pastor, Rev. Clifford Lones arrived to carry on God's work in Harrington. With his architecture and building experience we held a ground breaking service on May 1, 1983 on our property east of town. The new church building with a large sanctuary and several rooms was completed mostly by our own people under the direction of Pastor Lones. Our first service in the new building was on December 31, 1984, with a dedication service on November 24, 1985. Soon after the dedication Pastor Lones began the design and construction of the parsonage. In December, 1986, the ranch-style parsonage was completed and occupied by Pastor & Mrs. Lones and family until his retirement in early 1995. In June, 1996, we called Pastor Guy Simpson from Bedford, PA., as our third pastor. He and Susan and the boys moved in just prior to our twentieth anniversary celebration, June 24, 1996. Praise God for His faithfulness! God continued to multiply our people, thus creating a need for more room. Construction began on a large multi-purpose building and on Sunday, June 29, 1997, we held the dedication service of the Fellowship Center. Today, Independent Bible Fellowship Church continues to preach Christ Crucified, Risen and Coming Again. We feel blessed of God to be given the privilege of spreading His Word in our community, surrounding areas and around the world.